Made for selfies is the official tagline of the Nokia Lumia 730 Dual SIM. To live up to that Microsoft (in partnership with Coca Cola) used its mid-range Windows Phone offering to set a world record for most people captured in a single selfie. 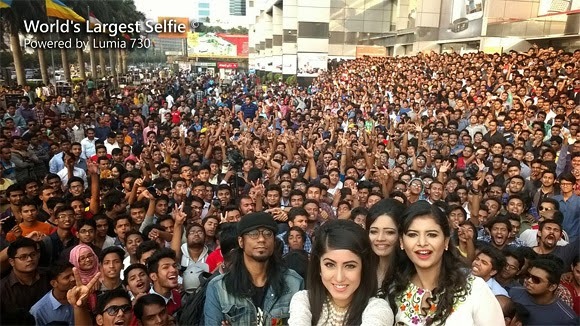 The result is a group shot of at least 1,151 people captured by the 5MP camera of the Lumia 730. The photo was taken yesterday in Bangladesh, with participants required to sign in to keep track of just how many were there. According to Guinness previous selfie-related records include Ellen DeGeneres' most-retweeted Oscar selfie and the biggest selfie chain - 279 people standing in line and taking selfies. Microsoft is still waiting for confirmation from Guinness on this record though. Recently, phone maker Lava attempted to beat the selfie chain record with around 1,000 people snapping selfies in a line using the Iris X5. This record hasn't been confirmed yet either.